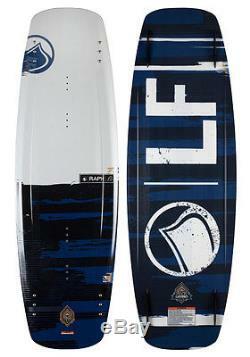 2015 LIQUID FORCE RAPH 143 CM WAKEBOARD (CABLE PARK). DESIGNED TO DOMINATE THE PARK! The most progressive rider in the world designed a board that dominates the park! Raph Derome has solidified himself as a premier rider and his first pro model board was built to take him to new levels... The RAPH hybrid is a hard charging cable/rail riding board designed for maximum catch-free performance on rails and kickers! Raph came to us wanting a no compromise park board that slides smooth without hang-ups while providing edging hold into and off of your hits. The RAPHs triple-stringer, Hybrid Composite Core is wrapped in a bullet proof Liquid Rail and LFs exclusive Grind Base to give you lots of lively spring and flex. This board is a mega performer that is ultra sensitive, giving it the ultimate in board control and feel... Strap in and give it a spin! Delivers a performance hull shape with precise flex and response properties. Precision CNC Triple-Stringer Wood/PU Core. Triple stringers between foam provides superior strength and lively flex. Single Concave Hull w/ Edge Channels. Concave softens landing and maintains speed while channels increase control and hold. Keeps the rail catch-free on rails, but holds on the water. Provides torsional rigidity with increased longitudinal flex. LF Slider Quad Fin Setup. The item "2015 LIQUID FORCE RAPH 143 CM WAKEBOARD (CABLE PARK)" is in sale since Monday, August 17, 2015. This item is in the category "Sporting Goods\Water Sports\Wakeboarding & Waterskiing\Wakeboards".